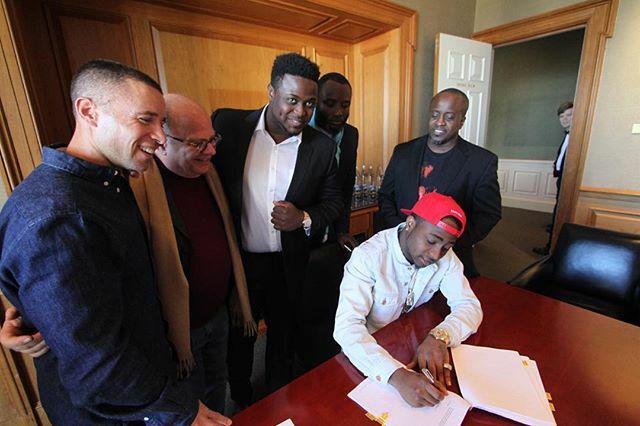 Sony Music Entertainment have signed musician Davido to a groundbreaking global agreement. The deal was inked at Sony Music offices in New York and will see the American-born Nigerian recording artist release his sophomore album later this year. In Africa, Davido is a bonafide superstar. After relocating to Nigeria from the United States aged 19, Davido set up HKN records alongside his brother and independently released the first song he ever recorded entitled, Back When. The track was an instant success and propelled Davido to national stardom as he followed this with the release of his second single and pan-African smash hit, Dami Duro. This track became one of the biggest airplay records not just on radio in Nigeria, but across the continent, catapulting him to superstar status and making him one of the most sought-after artists to collaborate with, widening his huge fan base and media support. His debut album, Omo Baba Olowo was released in 2012 to critical acclaim earning him numerous award nominations and accolades, including two MTV Africa Music Awards and the 2014 BET Award for Best African Act. A world tour followed which saw Davido perform to sell-out venues across Africa, Paris, New York and London. Today, Davido enjoys a massive social media following with a combined number of over 6-million followers across all his platforms. This deal represents a step forward for Sony Music Entertainment as it grows its roots in Africa. Announcing its official presence in Lagos, Nigeria verifies Sony Music Entertainment's decision to pursue new business via the introduction of on-the-ground operating entities in an expanded number of markets in the region. The timing of the decision is based on the convergence of a number of positive indicators in Africa's economy and positive signs in the music industry. Davido is a shining example of this. Sean Watson, managing director of Sony Music Entertainment Africa says; "Working with incredible talent like Davido heralds a new era for Sony Music Entertainment Africa on the continent. We couldn't be prouder of our partnership with Davido and we are extremely keen to support his vision to succeed at the highest level in our industry." “We are thrilled to welcome Davido into the Sony Music family. We are very much looking forward to bringing one of Africa's biggest stars to the world. We are also excited to partner with Kamal Ajiboye, Davido's manager as well as Efe Ogbeni, who will be executive producing the album on our behalf," adds Adam Granite, president of Northern and Eastern Europe and Africa. Davido says; "Music is the universal language that unites and betters the world. It's always been my dream to take my music and culture to all corners of the world so I'm blessed to be partnering with Sony Music Entertainment on this next chapter. My number one aim is to make my fans and Africa proud."